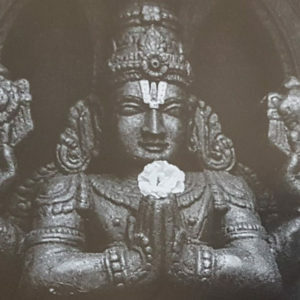 The invocation is traditionally chanted before the beginning of class to pay our respects to Patanjali, the sage who in around 200 BC, systematised yoga in the the Yoga Sutras which were previously conveyed orally. There are 196 sutras set out over four chapters or pada which provide a road map for our yogic journey. The first chapter deals with samadhi (the super-conscious state), the second with sadhana (the means) to achieve yoga, the third elaborates the vibhuti (powers or attainments) that the yogi comes across in his or her quest, and the fourth deals with kaivalya (emancipation). Each sutra is a terse verse dense with meaning, together they provide the foundations of yoga. The invocation is rich with symbolism and its vibrational energy brings mental focus preparing students for the class. It connects Yoga, Sanskrit and Ayurveda. The conch symbolises a readiness to face obstacles, the disc symbolises the destruction of ignorance and the thousand-headed cobra indicates that Patanjali will guide us in a thousand ways by showing us the several methods of practice and the approach to find the Soul within. There are two parts to the invocation, however, commonly only the first part is chanted in class. I bow before the noblest of sages Patanjali, who gave yoga for serenity and sanctity of mind, grammar for clarity and purity of speech and medicine for pure, perfect health. nescience in the third and blessing humanity from the fourth arm, while his lower body is like a coiled snake. I salute Lord Adisesa of the myriad serpent heads and mouths carrying noxious poisons, discarding which he came to Earth as a single headed Patanjali in order to eradicate ignorance and vanquish sorrow. I pay my obeisance to him, repository of all knowledge, amidst his attendant retinue. I pray to the Lord whose primordial form shines with peace and white effulgence, pristine in body, a master of yoga, who bestows on all his yogic light to enable mankind to rest in the house of the immortal soul. Beryl Bawcombe, based in Silsden near Keighley has been teaching for over 40 years. 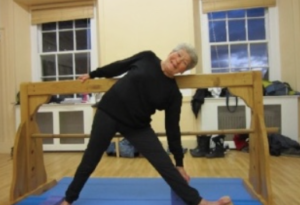 She was involved in the early days when Iyengar yoga was becoming established in the UK. Here is her yoga story. How did you get into Iyengar Yoga? My mother suggested that I try yoga as an alternative to sporting activities after I had my children. It was something I had never heard of before then! Mum was a farmer’s wife living in South Africa, while I had moved to the UK. In the late 1960’s my mother and a group of farmer’s wives, one of whom bought Light on yoga by BKS Iyengar, got together without a teacher and practised the poses and breathing and read about the philosophy. They did this for years and years. I was so impressed by my mother’s physical health and strength who was then in her sixties. So I signed up for an Iyengar Yoga class in Shipley, it had a two year waiting list! Eventually a place became available in 1974. My first teacher was Lilian Biggs, who at the time was teaching two classes a day at Shipley College with 40-50 students at a time. What were the yoga classes like? They were very tough and disciplined. Props were very limited, my first mat was a piece of carpet! You had to really work at the poses to achieve them. Lilian Biggs needed some help with her classes and told me that I would make a good teacher. Anyone who knew Lilian knows that she would not take no for an answer! What was teacher training like? I trained with Margaret Hopwood and around eight others. It was very tough but my competitive nature got me through it. What were your assessments like? For the Introductory level assessment, we travelled to the Manchester District and Iyengar Yoga Centre, and the assessors were from London. It was very scary, I was terrified as the assessors marched around the hall, which I knew was ridiculous but I’m sure all the teachers know what I’m talking about! Having passed the Introductory level, Lilian then urged me onto the Intermediate Junior Levels. The Intermediate Junior 1 assessment was held at Silsden Town Hall. Unfortunately all of us failed! The assessors said we just ‘had not got it’ and that we needed ‘to work a lot harder and deepen our understanding of the poses’. It was very discouraging but a few of us got back on our mats and eventually passed. There weren’t any teacher training courses, workshops, books etc. to help us. We just had to work out the poses for ourselves, which I think in retrospect was a good thing. For the Intermediate Junior Level 1, I spent months focused on my knees in the leg folding poses. It was a hard school. We had to innovative a lot more back then. I found ways to help myself which I then pass onto my students. I eventually passed all three Intermediate Junior Levels in 1992. It was quite a journey! How has yoga helped you in your life? Yoga helped me play competitive tennis, injury free, until I was 70 years of age. While I have had some joints replaced in my latter years, the doctors said that without the yoga I would have been in a wheel chair. I’ve adapted the poses to suit myself by using the props, particularly the chair. We are so lucky that Iyengar Yoga allows us to maintain a practice as we age. I now attend the therapy class in Keighley on a weekly basis so I have access to a large range of props and support from experienced teachers, which helps me continue to do my yoga practice.